Andrew Garfield, Emma Stone, Jamie Foxx, Dane de Haan, Paul Giamatti, Chris Cooper, Colm Feore, Sally Field, Felicity Jones, Campbell Scott, Embeth Davidtz. Audiences seem to have had a glut of Spiderman films in the last 10 years or more, three films with Toby Maguire, directed by Sam Raimi which, on the whole, were very popular. So, it was a surprise that Hollywood decided to re-boot Spiderman and begin another series. Whatever the reasons, here he is – again. One of the key things that this sequel does is to give some explanation about Peter Parker’s parents. In the previous film, it was shown that they disappeared, taking secret material with them, and not heard of again. This was something that made Peter Parker brew about his parents and himself. This time the film has quite an elaborate explanation of what happened, the work of Richard Parker with spiders and with human tissues, the exploitation of his work by his partner, his having to get away quickly with his material, taking his wife, farewelling his son as a little boy and leaving a video for him. It shows the Parkers in a plane escaping, but coming to a sad end. It is only later in the film that Peter himself begins to make investigations to discover what happened and to find his father’s video. In the meantime, he is involved in all kinds of exploits, confronting a truck with nuclear material, participating in havoc in Manhattan traffic, arriving just in time for his graduation, but missing the valedictory speech by Gwen (Emma Stone). But Aunt May (Sally Field) is there to congratulate her nephew. So, that is the first confrontation that Spiderman has to deal with. In the meantime, Peter and Gwen are seeing each other, in love. Then, onto the scene, comes his old friend and schoolmate, Harry Osborne (Dane de Haan), with a terminal illness but with a determination that getting a transplant of blood from Spiderman will cure him. He is remembering his father’s work with Peter’s father. Harry becomes more obsessed, asks his friend Peter for help, which puts Peter in rather a dilemma. However, Harry has an injection and turns into a monster, the Green Goblin, building up to a second confrontation with Spiderman. And just when you thought everything was resolved, there is quite a shock at the end – which publicists hope will not be revealed so that audiences will experience it in its fullness. Then, the film does go on from another 10 minutes, introducing another villain with Paul Giamatti’s face and voice but enclosed in a monstrous creature. This means that the last 10 minutes are in fact the trailer for the next episode. 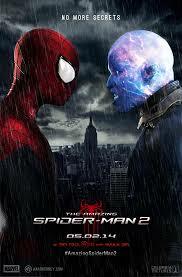 This makes this sequel something of an interim – with The Amazing Spiderman 3 to look forward to. 1. Marvel comics? Popularity, the film versions, the spirit of the Marvel comics and superheroes? 2. The Spiderman comics, the stories, the variety of film versions? 3. A New York story, the streets and buildings, the giant truck and the driver, driving through the traffic? Action, destruction? The contrast with Peter Parker, at home, his aunt, ordinary? College, graduation, speeches? The Osborne Corporation and buildings, interiors, the laboratories? The Osbornes, Harry and his father? Max, his apartment, his work, supervision, vistas of the city, electricity and power? 4. The prologue, Peter’s parents, their work and experiments, DNA, mutant possibilities, animals and humans? Parker and his treating himself? Spider venom? His partnership with Osborne, Osborne selling out? The decision to leave, leaving Peter, the video – and its not being seen till later? Parker and his wife, on the plane, the pilot dead, the killer, the fight, the crash? Peter later opening the bag, finding the video, information, the subway station and the secret entrance? Peter and his being able to accept what his parents had done? 5. Peter Parker as Spiderman, his clothes, the transformation, the spider qualities, the web? His missions? The populace and their response? The little boy and his admiration? In action and the traffic, the truck, the driver, his arrest and prison sentence? Peter’s being late for the graduation, Gwen’s speech? The family celebrating? 6. The special effects for Spiderman’s flight, the web? His love for Gwen, the continual appearances of her dead father? The blood, wanting to do his laundry, his aunt and the domestic scene? Harry returning, Peter going to see him, Harry’s disdain, change of heart, the request about Spiderman’s blood? Peter’s refusal? Spiderman and his meeting with Max, saving him, Max and his gratitude, pleasant, meeting Gwenn in the elevator, his birthday? 7. Max, his job, quiet, people ridiculing him, his birthday, falling into the tank, the transformation, being electrified, the effects, the transformation his appearance, giant? The city, the control of the electricity, plane flights etc? His turning against Spiderman? Gwen and her meeting him? The final confrontation? 8. Osborne, summoning Harry, his death, his attitude towards his son, the videos and his speeches? Harry, age, spurned by his father? The manager of the board, control over Harry, the board meeting and his lack of interest? Harry Gill, dine, needing the trans formation? Getting it, becoming the Green Copper, flying? The dramatic encounters, especially with Quentin? 9. Gwen, working in the office, the plans for Oxford, love for Peter, the final confrontation, his inability to rescue her, her fall and her death? 10. Peter retiring, the chaos in the city, the boy confronting the driver, the manic driver, his monster machine? Confronting Spiderman? The fight? 12. What Spiderman stood for, confronting evil, corruption, upholding what is right?